Are Laser Engraved Basketballs Worth The Price? Today’s world is full of amazing technology. Not only are the products you’re buying for your athletic programs higher tech than ever before but the decorating processes are better than ever before. Of course everyone has heard of sublimated uniforms and full color printing on things like scorers tables but have you seen laser engraved basketballs yet? The technology used in engraving basketballs has really gotten high tech. Detailed designs are now possible making this an option that many customers can’t live without. If you can spare a few dollars more per ball you can customize your basketballs with your team name and logo. Check out this design we just had done for one of our customers. This goes far beyond pad printing balls or stamping team names in block letters. The minimum purchase of 12 balls is not a problem for most customers and turn around time really isn’t bad at 2-4 weeks depending on the time of year. The design pictured here was done in a few days. So is laser engraving your basketballs worth the price? There are a few things to consider when making that decision. The first is… well they look really cool so in that respect heck yeah it’s worth it. The second thing you should consider is inventory control. It’s pretty easy to tell if that kid s walking out of the gym with one of your basketballs, because it will have your branding right on it. You could also use the balls as senior gifts at ceremonies giving that senior player something to remember his school days by. All in all laser engraved basketballs have come a long way over the years. So why not. If you have some extra booster club money or budget money on hand at the end of the season order some up. You will not be disappointed. 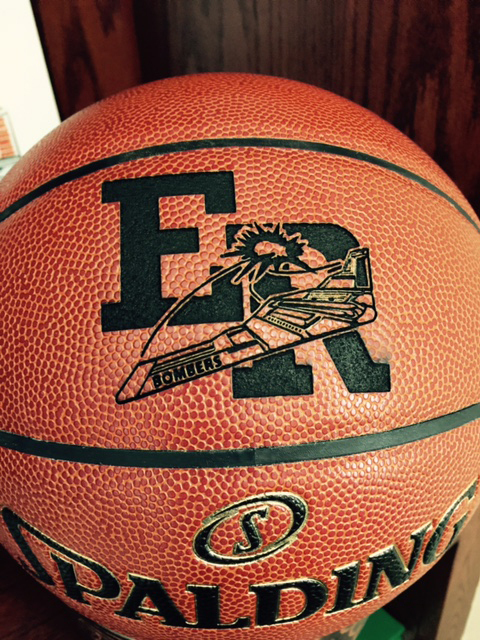 For more on laser engraved basketballs or to get a quote check out our web catalog at www.morleyathletic.com or give us a call 1-800-811-1931.